Bottega Veneta will launch Bottega Veneta pour Homme, the brand's first masculine fragrance, in September. The feminine counterpart, Bottega Veneta Eau de Parfum, was introduced in 2011. The notes include bergamot, pine, juniper berry, Jamaican pimento, fir balsam, sage, patchouli, and leather. 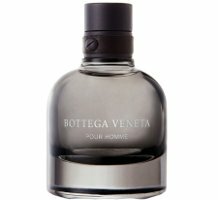 Bottega Veneta pour Homme will be available in 50 and 90 ml Eau de Toilette. It does. Keeping fingers crossed. Bottega Veneta for Women is one of my top 20 Favorites Scents…. EVER! It’s THAT Magical! I KNOW this is going to be OUTSTANDING! Oh, I like the sound of that. Hope it’s as good as the woman’s original scent. Ditto. I love the women’s scent and hope the men’s version comes up to the same standard (and lives up to the appealing sound of its note list). The bottle looks lovely and the perfume sounds actually nice. I’ll be curious to give it a try when it appears in stores. I kind of like that they do leather scents. The question of ‘what qualifies a glorified tailor (clothing designers) to make fragrances?’ often gets asked on NST. Since Bottega Veneta is mostly known for their woven leather handbags it feels like they’re keeping in line with their roots. Ill definitely give this a sniff. I bought Bottega for my girl, so maybe we can have a matching pair of scents! Awww, sooooo cute. Haha, no, just kidding, that will never happen. If this is worth it, i will just have to wait for hers to run out first. Ooooh, I love BV for women and have been trying to find a men’s scent I love..I don’t love any, I just don’t. So picky with men’s scents. Maybe BV will help me find the one! Though, don’t care for sage much, we shall see though, would love to sniff. Woody+leather is good though, and pimento, haven’t smelled that note! Curious! Like the bottle too! I love the bottle – what a cool gray! The juice sounds good too. I hope Nordstrom carries this; if not I will stop by the BV boutique in NYC to take a sniff. OH GOD! I THINK I JUST PLOTZED! Been Waiting EVER SO Long, hoping this scent would Happen! AND IT HAS! I am Beyond Words. Happiness And JOY! IMMEDIATE MUST BUY! FINALLY something to look forward to. Looks like it’s going to be a modern classic. I haven’t been this excited about smelling a fragrance in a long time! Just imagining how this is going to smell. Love that they’re keeping the same bottle shape too. I don’t think this will disappoint at all; love the women’s fragrances, so I have high expectations of this one too. So far, so good! As much as others hate to see the same bottle designs over and over again for certain companies, I feel as if a simple design like this focuses more on the fragrance as well as the consistent image of a company. Very classy! Like others have said — love the original female version, hopefully this one is just as good! Feel like the femme one has an old school vibe, yet not dated, and the notes in this one sort of sound like that may also be the case. Sounds fantastic. I liked the original, but felt that it wore a bit too subdued on my skin. I hope the men’s has a bit more oomph. I liked it:) FB worthy to me!